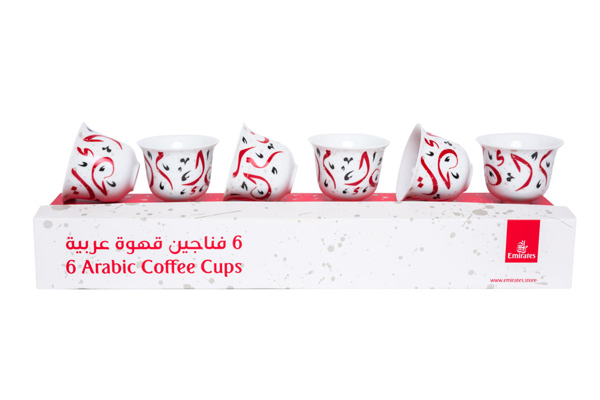 Emirates Official Store has launched a limited edition Arabic coffee cup collection in collaboration with Silsal. The Silsal for Emirates collection of six Arabic fine porcelain coffee cups are adorned with the word ‘Al Emarat’ (which means Emirates in Arabic), written in the ancient ‘Diwani’ calligraphic script. The flowing Arabic letters are surrounded by bold brushstrokes, beautiful glyphs, and playful splashes of paint to give them a modern edge. In addition, the designs incorporate the airline’s trademark color palette of red and black.